When people think of Grand Island, they invariably picture the bridges connecting it with Buffalo to the south and Niagara Falls to the north. They might also think of it as a pleasant and conveniently located suburb or envision the island's natural beauty with the majestic Niagara River flowing serenely around it. But there were no bridges before 1935, and most people know little of the island's long, fascinating history up to that time. To the Iroquois, it was a valued hunting and fishing preserve; to British and French imperialists, a contested frontier asset. After American independence, it became whatever people could dream up: a tax-free utopian settlement, a refuge for Europe's persecuted Jews, a source of timber for Yankee clipper ships, a summer retreat for the wealthy, a playground for the masses, or a collection of small farm villages -- all before it assumed its suburban form. Its colorful story, presented through this book's images, emerged from interactions between its unique geography and human imagination. 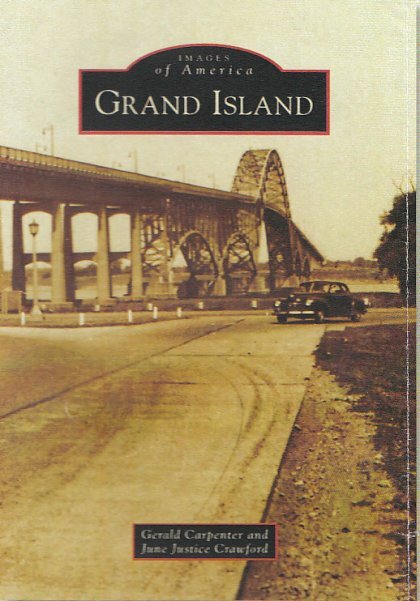 The impetus for this book came from the Grand Island Historic Preservation Advisory Board. Its images come mostly from private collections. June Justice Crawford is a Grand Island resident, while Gerald Carpenter has been a visitor for decades.